Keith shows onlookers how he makes music with wires. “Modular” and “analog” are often assumed to be synonymous, but in Keith’s rack, they definitely aren’t. A growing number of digital modules takes the software that previously ran only on computer and encases it in these small boxes, allowing software to be patched with cables instead of operated, as I say in the audio, via a “folding typewriter” interfaced of a laptop. None of this would mean anything if Keith didn’t make good music. If this were beard-scratching music, he’d have the beard for it, but it’s more than that. I heard Keith’s live performance this year first at Berghain, the cavernous former power station dance club in Berlin, and then in a pristine array of speakers provided by GRM at Paris’ Présences électronique. 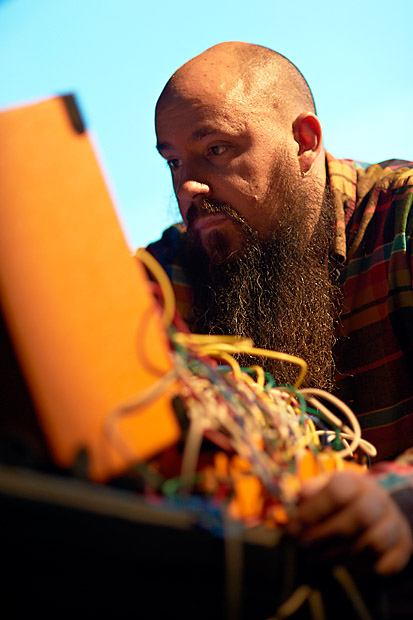 Keith Fullerton Whitman, Berghain, CTM.13 Festival – © CTM / marco microbi/photophunk.com 2013. 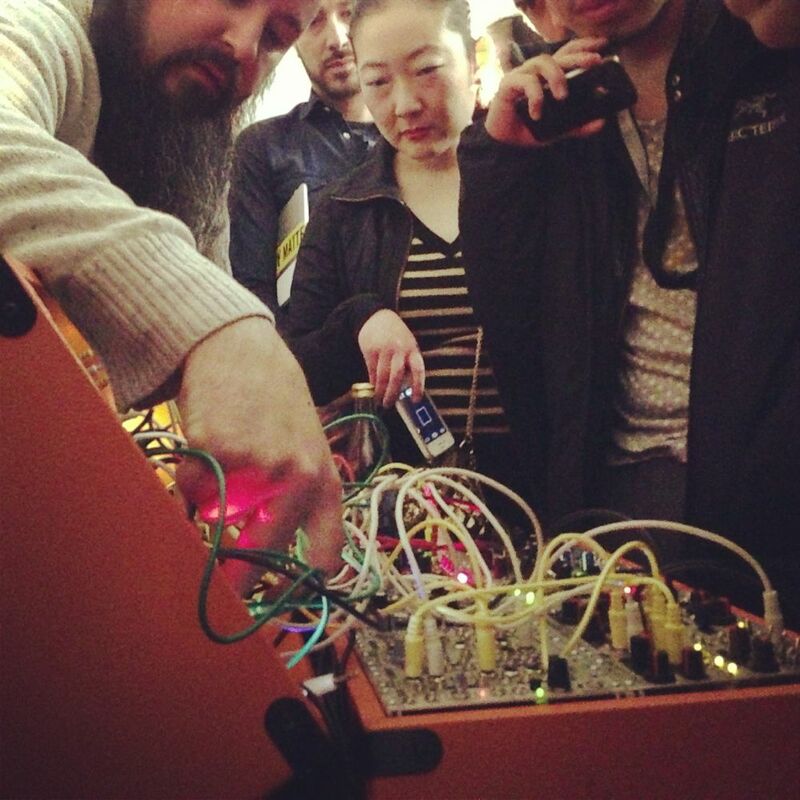 Courtesy CTM Festival. Keith’s music is, to me, eminently sensual. At Berghain, rumbling bass found its way into the gut as sounds splashed against the concrete walls in spinning, dizzying succession. In Paris, those same points of noise were more crystallized, in a jazz-like display of syncopation and oozing entities of sonic color. This is not just the fuzzy sounds of analog you might know: it’s a full range of sound possibilities as complete as that of any computer. And, in some sense, it is an array of computers, using only a different interface. But it’s also emotionally motivated. And so, in addition to the interview, it’s worth taking a listen to the twelve (yes, twelve) hours of music inspired by childhood experimentation. Keith explains his motivation there. Music, electronic or not, seems at its best when personal and intimate, and here, I think he gets right at how that works for him. Thanks, Keith; I look forward to more. … on the eve of my 30th birthday, I began rendering “automatic” “enhancements” of only the most salient points of the pop music of my youth ; a line, bar, or fragment of a particular song (after being heard out in “the wild” in the present ; akin to running into an old friend on the street) was chosen based on how much my nostalgic recollection of it differed from its contemporary reality. Each was played back at exactly half-speed, then run through a series of time- and gain-based processes that slowly & meticulously chewed through the audio, revealing hidden layers of content, context, and temporal / spectral production details … shining a flashlight into the dark corners of each selection, revealing the ghosts lurking within.